Jill James, our series host, talks with Jay Allen from Safety FM. They cover topics including his broadcasting background, trying to settle on a major, and Jay explains how a vehicle fatality gave him a push to get into safety. This is the Accidental Safety Pro brought to you by Vivid Learning Systems and the Health and Safety Institute, episode number 23. My name is Jill James Vivid's chief safety officer. And today, I'm joined by Jay Allen, who is a safety professional, and the creator of Safety FM. Welcome to the show, Jay. So, Jay, this is kind of a first for you. Usually, you are the one interviewing guests for Safety FM, but we're turning the tables today. Are you ready? I think about as ready as I can be. It's definitely a different approach but we'll see how this goes. Oh, well, I'm so happy to have you here and I know, we've sort of been doing a little bit of arm-twisting to get Jay on the other side of the microphone. So Jay, you are a safety professional and you have never told me your story in the times that we've spoken. And so, I am very interested for you to share your story not only for my curiosity but for our guests as well. How did you get into safety and where did it all start because I'm guessing it's a winding path like everybody else. Well, being on the Accidental Safety Pro, it happened by accident as you can assume. It was pretty interesting because I was actually an operations person for a long period of time for a transportation company. And we actually outsource to, we'll say independent contractors. And we had an issue out in the Seattle market with one of our independent contractors who was in both inside of a vehicle accident. As this vehicle accident had occurred, we ended up injuring somebody in another vehicle that led to a fatality. And that right there, that occurrence, when that happened, I started looking at, well, maybe the whole revenue side is not as important as people getting home safely. That really what started my career path and really looking at safety. At the time, I didn't realize that that was really what I was focusing on. I was just more like, oh, we need to get people, but I wasn't looking at it as safety only, I was looking at let's do a combination of both, but really started leaning heavily towards safety but didn't realize it until probably about a couple of years later down the road. And so, talk about that operations job that you had. How did you get into operations and how long were you in that before this event happened that sort of changed your trajectory? Well, the funny part was that I was actually involved with a pretty large electronic company and I won't say them by name, but they sometimes were blue and yellow, I'm just saying. I had actually worked for them, and they started to outsource a lot of their stuff that they were doing internally. So what I did was it was a company that came about and said, would you be interested in handling some of our operations. I had already been with this blue and yellow company roughly about almost six years. And I decided to go ahead and go to this other company doing the transportation side. I was there and I was based out of Miami, Florida, which is the funny part. But my region covered from Miami, Florida, to Tennessee, Portland, Oregon, and Seattle, Washington, which I still don't know how that's a territory, but that's how they work. So I did a lot of traveling at the time. So as I'm doing the traveling, I was probably about a year into working for that organization when this event occurred. I was up to actually assist at a location, they were supposed to be covering somebody's vacation for probably about four days. And this four day trip ended up becoming a 19 day trip because of everything that was involved and everything that had occurred. It was a catastrophe in regards, but of course, anytime that you have any kind of environment where somebody's dead, it's crucial and it changes the organization. The way that we looked at her because we were number one, a third party vendor, then number two, ll our logo or the logo for the company that were were representing was all over the news and we had to shut down the 405. So it became very interesting in regards of, now we have all this media attention and it's bad attention, let's just be realistic. And it's like, what parts could we do to correct it? And keep in mind, that when you're dealing from a third party vendor standpoint, they don't look at the third party vendor, they're looking at a person who has the logo on the side of the vehicle. So that was portion of what did we do wrong and what can we do to correct our processes to make sure that we're doing things correctly, that we don't have a similar issue going forward? Now keep in mind, error is going to occur, but how can we avoid these catastrophic failures? Yeah, and you were looking at it from a couple of different angles, it sounds like I mean, not only the negative brand recognition, but really hitting you in the heart of someone had a loss of life here. Right. The interesting part was, I went out to the scene of the incident and why I'm standing there at the scene. At this point, I don't understand anything about accident investigations or anything along those lines. So I'm standing there just as a person to try to provide information to the cops and to the medical people that are there. And as we're going through the discussions, the person's parents showed up. And as I'm streaming there, the parent turns around and says, "My kid's girlfriend is pregnant and she's eight months along the road." And I'm not trying to go dark here but this just kind of added a whole other level into the whole thing. And as I sat there, I was like, we're definitely doing this wrong, what can we do to correct these matters going forward? How was your driver? Did the driver survive? Well, the interesting portion about it is dealing with independent contractors, if you're not vetting the whole process correctly, you can run into some problems. And the way that the home delivery business works is you normally have a, what we call "a driver and then an assistant" that's inside of the vehicle with them. On this particular day, no one caught it and it wasn't a driver and assistant. It was two assistants that were in there but one decided to drive. And so, he was not "a qualified driver." That opened a whole other can. I know. Where do we go from there? Yeah, right. There's so many elements when it comes to safety. People often ask, like, what does a safety professional do in a day? Well, you know, we just ticked off a whole bunch on a list of like all the different pieces, parts and fingers that impact day to day safety things. And you're an operations person at the time not even a safety person. So, what happened, what happened next? You're standing there, you're with that family, you're hearing all of these stories. And you're like, hey, I'm the operations guy, I'm not the safety guy. Yeah, what took off? Well, that's the interesting part because keep in mind that we're still interacting as a third party vendor so we have to contact our primary customer to let them know what's going on. We have to turn around and say, this has just occurred, I'm sure if you turn on the news, everybody in their brother knows at this particular moment what's going on. Then I'm reporting back to my company of this is what's going on, we need some kind of insurance representative and investigator, or we can have our side of what exactly occurred. And it becomes more and more interesting, and I thought about this years later about, when you look at the whole scenario, do you look at it is, was the what we all call the assistant in the wrong for trying to get the work accomplished, or was he in the right for doing everything possible to get the work accomplish? So it's one of those catches on how you have to look at it. It's all about perspective. Yeah, absolutely. Absolutely, it is. So what happened next for your career? Well, the interesting part is that I'm still involved with operations but I really started looking at operations as a whole. I'm still interested but safety is really kind of laying heavy on my heart, and I started really getting engaged with another organization that was similar to this blue and yellow. They were mostly red and no longer in business. But I started interacting with them but they let me do some safety things that I wanted to do inside of their transportation side of the company. They ended up folding. So what I ended up doing is I started doing my own consulting company, and I started interacting with companies that do transportation, using this scenario of what occurred with one of my previous employers and then trying to go, if we have these issues, how can we correct them? And it had become something very interesting as I went down the path because companies were open to ideas but not so open when it came to some third party vendors. Sometimes they wanted somebody who had name recognition. At that moment portion, I'm relatively young, let's see, I want to say, I'm probably 28, 29. I'm a little kid to how they're viewing it and I'm going into these very large established organizations, and they're looking at me going, how is this kid going to know better than I do? It was interesting trying to get that information out. So I really started tying into, I'll say, "established people" within the industry that would allow me to learn their methodology in regards of how they were actually bringing forward the information on when they were discussing with people from the line level. And we didn't get a lot of C level people, but we got a lot of directors and regional people at the time. Sure. And so, you were essentially being an entrepreneur but trying to teach yourself at the same time by working through these established organizations. Right. And when you have somebody who's established and we'll use some of the big name, let's say, electronic companies that also sell other things that used to be very popular at the mall, that are still around but kind of struggling, they don't really want to hear, or at the time, they didn't want to hear the younger person's perspective because they didn't have as much influence or knowledge from the way that they brought it forward. Right. So what did you do to build your your street credit that time as a young person? How did you find a win for yourself? Well, the fun part was that I found this gentleman that was an older gentleman that was kind of in the twilight of his career and he had a lot of connections with people inside of that industry of transportation. And he let me really kind of sit at his footsteps in regards of really being able to learn and understand some of the concepts of the business, and I'm talking more along the operation side, and how these items could be tied in. We won't say "so much from safety," but it was more along the lines of how can it be a financial benefit to an organization for them to go ahead and say, okay, this might make sense because in the back end, you could save us x.
Yeah. You were leaning into your operations discipline then and being able to, like, how can I apply this. Right. What I understood at the time is, I had a degree in broadcasting which has nothing to do with transportation and definitely had nothing to do with the retail market. But I knew that I could package things at the time from an audio content that I could understand that when I'm standing in front of someone, where I could actually change their mind, I normally refer to it at this time as theater of the mind of how you're actually drawing the story. It's kind of this thing about like the old days of radio, the golden age of radio. You didn't really have a TV show, you sat around your radio and you were listening to a story. And if you could develop that story as you were telling it to people, they were very interested in what you had to say. So you were able to leverage your broadcasting background to do that story except it was in front of a live studio audience every time, right? The first few times of actually doing something in front of people when you're used to sitting behind a microphone where you don't get to interact, let's say, "with people in person," it becomes very intriguing on how that works because you see the reaction on the face and how are they going to absorb the information and are you going down the right path when they make the face. So, it was interesting at first, I kind of chuckled, but looking back at it now, and I'm like, I should have taken more public speaking classes at the time. It's a totally different experience when you can see and feel the energy of your audience and you have to change on, yeah, you have to adapt and change or you're sinking. So let's back up because our audiences just heard you say you have a broadcasting degree and anyone who's listening to your voice right now who's been thinking, man, that guy has a voice for radio, aha, yes, you do. A lot of people say I have a face for radio, I don't have a voice for radio, I have a face for radio. The funny part was, I tell a lot of people I have the voice that sounds like this because my parents spent a lot of money to get me to have my voice developed in this particular pattern. No way. Well, okay, let's stop there. How do parents develop their child's voice? I want to hear this story. They sent me to college and they let me change major five times without trying to kill me. So, this is for sure how this voice ended up turning this way. That's awesome. And so, you went to college, you got a broadcasting degree, and then you ended up in operations. How did that happen? Well, that's the fun part because at the time, I was doing my degree to get my broadcasting degree. But I was going through school but I was making enough money in the private sector where it didn't make sense to me just to go into broadcasting full time. So I did it from a part time aspect. People would make me job offers, but I was like, at the time, I was so young, I was more hung up on the money than what it was for the experience, not thinking, hey, the experience is what's going to guide me down the path. So I kept on turning down positions and I would just go, okay, I've been working here as I was going through college, so I'll just stay doing the same thing, not realizing that I was not advancing the career that my parents helped pay for and what I wanted to do in the long run. That's pretty cool. But, you know, it sounds like very inventive, Jay in ow you pulled this career together, which I'm guessing is still an evolution to this day. Creating theater of the mind and winding safety into it, that's fantastic. So, what happened, what happened next, because I'm guessing, you know, you said you continued, you found this mentor, you were working still with electronics industry but that's kind of waning as well, industry wise. So where did your path lead next? I'm still continuing down the path of doing transportation. The mentor has, really has started to decide to pull back a little bit. He's getting to, he's getting a little bit older and he doesn't want to do so many things where we're sharing information. He's more of, I want to be able to establish my company so far and well that I'm able to sell it, which I totally understand. He doesn't mentor me as much going forward but he did it for a year, so I can't say anything bad. It was a great experience the whole time. I decided to say, hmm, maybe the consulting things and not for me, and I decided to go directly back in to the aspect of just doing operations. So I go to another transportation company and I'm just doing operations from the standpoint of, let's establish like ground level stuff. I'm going into this organization and I'm opening brand new locations where they're dropping me inside of these towns I have, depending on where I was at six to 12 weeks to have absolutely nothing. I start off with nothing. So I have to find a warehouse, find the independent contractors and establish the place and we have a deadline of x. So it was a fun job. My wife really loved that I was gone 90% of the time. It was one of those things that I was like, either I'm going to be married to the road or I'm going to be by myself, one of the other things because I didn't think she was going to stick around with how much time I was actually traveling. Now the interesting part was, I started to notice more and more that it was very difficult to get independent contractors to understand some of the, we'll say, at the time, I didn't know the word but we'll say safety culture on how to much to tie in because I'm an independent contractor, and nothing wrong about independent contractors, but they treat their self as their own business because they're their own separate entity. It's kind of hard to establish of, hey, the company that I'm representing, meaning, me, Jay Allen, does this, this and this, and this is what we're going to hold you too because you are totally separate entity. So it becomes very difficult to say, well, this is the minimum guidelines but you're an independent contractor and you're not an employee so it's that very fine line of employee employer. Yeah. So you had to get, you had to become a masterful at explaining that employer employee relationship piece and the multi-employer work site policy that OSHA likes to talk about often, because it's a thing. I mean, it's a thing and people sort of like you said, like this, I don't work for that company so I kind of get to do it in my own way. And that's not the case. Well, and that's the fun part because how can you turn around and tell somebody, okay, you need to be here by this time, you need to go do this work, you need to wear this kind of uniform. Oh, by the way, you're not an employee, you're an independent contractor, oh, and we're going to hold you accountable for these kind of guidelines. It's such a weird spot to be in. But as I did that, I learned so much about the different industries, and then I really started noticing on what I'll call the psychology of safety, where it became very interesting when you were interacting with people on, you could have the conversation of what do you do when you see a speed limit sign and be like, well, go maybe five miles above the speed limit or 10 miles above the speed limit. And you turn around and go, what happens if you see a police officer around that sign? Well, I'll slow down. And so, I started to look at it and I go, well, people want rules but they want rules that are enforced or enforceable, at least at the time, that's what I thought, and my mind has really changed since then. But I looked at it in regards of, so the behavior's going to drive the way that people do things. And I say, this is what I want to do. I want to get more information about safety but I don't want to be a safety engineer. And I turn around and I go, let's go ahead and go back to school and I'm going to go ahead and go get my doctorate in psychology. Both of my parents were in the Marines, which is kind of funny, I still chuckle about that years later. And it was a great thing but they were done with my college adventures. They pretty much told me that I was on my own going forward. The interesting part was the university that I went to had an option of you getting a psychology degree. You get a masters or you get a doctorate, but you didn't have to get both, which I was like, this is weird, and normally is not the pattern, but I'm just going to go straight for the doctorate and use that instead. Now, not realizing at the time, the amount of work, which you're going to have to put into it, which was always the fun part, but the amount of research that went into it. And I didn't look at it that from the master standpoint, that if you had the masters, people looked at you and said, okay, you're a practitioner and you understand academics. And when you start getting into the doctorate level, it's more along the lines of you are an academic and you probably don't understand practical as much as somebody who would their masters. And I always go, isn't that funny? I essentially paid all kinds of money to become "a scientist." I've got to talk about the fact that you had on your show, Safety FM, Dr. Todd Loushine, PhD as well. And he loves to talk about research. And so the two of you together must have really geeked out on that episode. And Todd's a dear friend of mine in safety but this is sounding familiar to me. I have to tell you, yes, it was a great episode. The funny part was, at the time, I wasn't doing what we'll say, "the lifestyle," where right now if you come on to Safety FM, we'll record the moment, we'll recorded for the podcast piece but we're airing it live on the internet screen. So at the time that he came on, we weren't doing that yet. So we spent a good 30 minutes before the interview speaking about very interesting stuff but I never told him that I was recording and I felt that it would be wrong on my behalf if I turned around and said, okay, well, I recorded that but I'm going to go ahead and air it but you didn't know that at the time. But it was very interesting conversation. If I ever released the director's cut on some of the podcasts that I've done in the past, it might be an interesting conversation for some, but we would probably still have to edit out some of the companies for sure. I bet he would love to have that. What makes both of you and unique in that regard with your PhDs in different disciplines of course, is that you both have these practical, like you're talking about, these practical pieces of your background to be able to apply to this really academic education that you ended up taking your career to the next step. So you have your whole background in operations and Dr. Todd has his in various other arenas as well. And I think that makes for a really wicked combination, wicked meaning in a really good and effective manner. So, what did you do with that degree? That's been the fun part. So, I decided that operations, I still like, but I'm not in love with. I really started to focus on interacting with organizations that were safety minded but not safety focused. Does that make sense? So, what I mean is that they understand safety, but they're not solely focused on safety alone. And this is going to sound terrible, so what I would do is I would go into these organizations and do research. I know, it's terrible. I'd be able to do research because I know they understand the concept of safety but then it was how do I change the mentality and the culture inside of them focusing on being safety focused. And that it was always an interesting concept, because on most job interviews, at least at that time, I wouldn't tell people that I had a PhD or that I was even going for it. And the reason behind it because I thought that it would throw people off, and not that I was trying to be deceiving, it was just, I didn't want to become that scientists or safety nerd guy. So as I did that, it was interesting just to see the different aspects on what companies and organizations do. And this one, I will try not to mention colors, letters or anything to that extent because I think it'd be wrong on my part to do that. Can't wait to hear what you learned. It was interesting on, when you take a look at what the field people are doing and the way that they do the work compared to what somebody behind a desk tells them to do, it becomes something entirely different. So, the use of the concept, or a lot of people say the concept, work imagined opposed to the work that's actually performed. And the work imagine is great because somebody sitting inside of an office behind a desk saying this is how we should do it. But the work [inaudible] entirely different out there in the field. And as I looked at it, it was, that conversation you had with the field people where they turn around and they tell you, this is how we're supposed to train you, but this is how we actually do it. And it was entirely different. And I was like, how do we change that mentality from a C level to understand what we're teaching people is not what's being done in the field. And that's where a lot of the excitement occurred inside of the organization. Right. And, you know, and I guess I found that neither one is necessarily right nor wrong. And both can learn from one another. However, I have to lean toward the way that it's being performed. If you adapt the safety to the way people are doing things, you can have a greater success. Is that what your research phone? Right, and that's exactly it. Now, I'll tell you, I was in love with behavior based safety and there's nothing wrong with behavior based safety. It's something where if you need a starting point, that's a great starting point. But the more I looked into it, the more I felt that it was, you have a better worker, you'll have a safer environment. And I thought that it was conceptually wrong but that was from my perspective. And I know people have different points of views and they're perfectly fine. I am telling you what I'll say my belief in safety. Yes, please, keep going with it. So I just want to make sure that that's clear because everybody's going to look at it differently. But as I looked more and more into the way that it worked, I didn't think the 329 anyone was accurate. I can tell you that when I didn't have common sense, I would be on my phone behind the wheel and go, okay, boom, this makes sense and I've done this over 300 times that I haven't had any kind of issues or major incident. And I kept on looking at those numbers and said, this doesn't seem correct. But then I found what they call you in an organizational performance. This is a different style of safety. You in an organizational performance. This is something that the department of energy created after Three Mile Island occurred. So that's where it gets even more interesting. The main concepts here talk mostly about error's normal, bullying fixes nothing, your system will drive the behavior of the organization. Learning is vital. And how your people inside of the organization respond matters. And I was like, if you take those five simple concepts, and it's a philosophy because it's definitely, you're not building a program around it. It's a philosophy, and if you can do with this shift inside of an organization, on looking at those five concepts, you might have a better safety system than what most people do that already have something else. Now, keep in mind that if you are running a behavior-based safety system, you have a sunk cost. And this is an enhancement too. I don't ever look at it or go into an organization to go, get rid of behavior based safety, this makes no sense. No, you have a sunk cost that got you to that point. Now let's expand on it. And I think that's what a lot of the research that I did or white papers is I tell people, help me out with regard to learning that as I was inside of the organizations. Right, it really seems, the five concept really seems like a, kind of like a roadmap, like a way to like every time you have an initiative, an idea, a process, whatever it is, like how do we apply this? Am I getting that correctly? [inaudible] you say that because high performance computing, this is what they use also for programming. They look at how this is going to be normal and that there's going to be a problem. So that's the fun part is that we try to build out the systems that they're error free and we're driving to zero and hey, they're great catch phrases. They're not real. If you have zero issues for over a year, I think somebody didn't report something, I think that somebody didn't report a near miss, something along those lines. But if you build it into the whole concept of error's normal and we're going to have a failure, but can we build safeguards in place where the error can occur and our system still works, I think you have a different concept as an organization. And the error isn't catastrophic. Absolutely. It's the capacity of being able to accept that the error is going to occur. So, if you have an incident that occurs but it falls into that safeguard section, that was a planned event and it went exactly how it should. That's a great thing. Yeah. So how did you get to implement these five concepts? Well, that's the fun part. Because when you sit there and you start having conversations with people that have put all this money into behavior based safety, it's really driving it from the perspective depending on the organization, like, how can you tie it into process improvement? Because those five concepts are not safety alone. Absolutely, I'm just thinking of all the different ways we could do this, whether it's just the culture of a company, including processes and lots of them. At the time, I could speak, or I could speak lingo that the operations people cared about. So, I tied it in from that side, and that made it a lot easier to go, well, if it's working here, how can it not work there. And then really taking the concept of having the people that are out in the field that are doing the work. And I'm not saying that everything they do is perfect but they have a good understanding of what's being done. And let them teach us an organization on what we can do better. And how you actually respond to that is going to change the trajectory of your company, but you have leaders that are open-minded enough to understand and accept the concept, understanding that you have an accident and you can't run out there and be like, everybody needs to be retrained because this occurred, and we're having a training tonight and five o'clock in the afternoon. And we're going to sing it louder to make sure that everybody understands because it's not going to change anything. Isn't that so true? Did you find some leaders who were evolved enough to take this on? Conceptually, there was a lot of people that said, great idea, let's move forward. But then when the error occurred, that's when the conversation would change. And I'm not saying that you can restrict a leader but it's doing that shift of, can we bring you back and get you into that mental model of what we're trying to portray. Right. Rewiring their brain from their instinctual, this is how you react. This is how we've always reacted to an event, to tragedy, whatever it is. Yeah, what happened? We changed the way that we look at safety opposed to it just being safety is the absence of accidents. And this is a definition that I stole from Dr. Todd Conklin. We take a look at it and go safety is not the absence of accidents, but safety is the presence of defenses. I think that is a true definition of safety. A concept that he talks about a lot is this, the car industry, especially if you look at Volvo in particular, they have made the determination that they are aware that people are going to get into car accidents. So, they make their vehicles with the understanding that you are going to be involved in a car accident at one point or another. But they make their vehicles where they say they're fatality proof. And if you do research on Volvo, they haven't had a car accident where someone's died in it over the last three years. Whoa, fantastic. Now we all want to buy a Volvo. I know. I tell my wife all the time, you need to get a Volvo. That's where we need to go. I'm looking at making a car purchase in the next year, thank you for that anecdote. Appreciate it. And this is not a sponsorship by Volvo. But I do have an affiliate link on my website. No, I'm kidding. Excellent. So, do you have a successful story to share on a leader who bought into this? Well, the thing is what the leaders have noticed, I want to tell you the name of the company just for you to understand but I can't, that's the problem. This organization is very, very, very well known. I can't even tell you the industry because you'll figure it out. But they took the concepts and took them back into the organization, and I'm going to tell you, it's not going to change anything overnight. So, I just want to be a realistic as possible because that's not a magic bullet, it's not going to change anything. They took the concepts and they went back to their board. And they said, this is what we're going to implement going forward. And the gentleman was from a foreign country. He is the CEO of the company and he goes, this is what we're going to establish. We're going to take a risk on this to see if we can change the trajectory. And being as they had already seen the changes inside of the operation side, they decided we're going to do it in safety. The safety program, yes, it has problems, just like any other safety program because keep in mind, it's a philosophy. So, it's changing the people that are out in the field from understanding, yes, this is what we did in the past but this is what we're moving from and we're trying to build around, "that we know that there's going to be a problem." And that whole thing of having them self report was the biggest issue we ran into at the very beginning. Because it was, well, what's going to happen during my review. If you're telling me that right now it's okay for me to self report are you going to remember this when my review comes up in three weeks, four weeks, five months? How is that going to affect? Really having the organizational leader turn around and say, no, we're going to take a look at it and what happens happens, and we're going to learn from it. And keep in mind, new misreporting, error reporting, they're going to go up quite a bit if you go down this concept because you want to have that open and honest conversation. And hopefully you're going to continue seeing severity going down and down and down. It's going to spike because [inaudible] this drive to zero that you might have been practicing or working on, this is where everything is going to come out of the woodwork, and people are going to test it at first. They're going to say, here's one and let's see how you're going to react. Maybe here's two, and they want to see your reaction, and the moment that if you have a leader lose it, they're going to turn around and go, okay, hold everything back because, boom. And then the problem was that when we started to do the change inside of the organization, the majority of the leaders that were there were still being bonused off of how many incidents they had or did not have. So it was very difficult at the very beginning. Had to change a lot of things. It was very difficult at the very beginning because it was like, well, we want you to report but you're going to affect me financially/personally because this is going to, might take home money for my bonus that I might get quarterly, yearly, monthly, is just going to suffer until we have this built into the system. This was a conversation with inside of the organization where the CEO was fine with having the conversation and he ran with me and said, we're going to move forward with it. And it was so weird because it was like, I didn't expect you to have that kind of response. I thought it was going to be the ramp up, the buildup. Because normally when you're trying to change any kind of culture to this extent, you need to bring in what I call "a big name person" or somebody from the outside that might be saying exactly what your safety person is saying what they need to hear from somebody else. Yes. I often tell people you can't be a prophet in your own land. So you have to bring in that prophet even though you're saying the same dang thing. Oh, wow. So, did they end up changing the way they incentivized the leadership or how did that work so they weren't incongruent? Well, they essentially ended up changing how that actually was handled. And they went more from, I won't say a performance base regards of how they were doing in safety, it was more along the lines of they started doing it very shortly. And there was a select failure there where they started saying, okay, let's do it based off of the amount of near misses that you return. And then they called something else leadership walks, which essentially are audit and the amount of audits returned in. And then that became a weird thing too because you would see the lows, and then the peaks and the valleys, and the spikes because they knew that at a certain time it'd need to be turned it. So it was, we'll say it was a learning scenario over two to three years before, I won't say that it was perfect because no system's perfect or no philosophy is perfect. But they got it where they understood, and it was that aha moment of, now we feel like we're going into the correct trajectory of what we should be doing. And so, what ended up happening or is it still in process? What sort of rewards were found? Well, the way that I look at it is this is going to always be an ongoing journey. I don't think that you ever get to a portion where you're the safest company on the planet. Now, somebody might be able to deem you with that title. But it's something that you're always going to learn. Even the way that the interviews are conducted now is so different because you go into this organization and they talk a little bit about human and organizational performance during the interview. Now, you don't understand that that's what's going on during the interview but it's one of those things where they're making sure that you understand basic foundations before I bring in. It's just great to see overall. Well, congratulations on that. That sounds like a fantastic success story. And if our guests who are listening, if they've not heard of human or organizational performance including these five concepts you were talking about, what resources might you direct them to if they want to dig into this a little more? Well, if they want to dig into it a little bit more depending on how little and how much, of course, the Department of Energy has Volume One and Volume Two that's available. And that's a free download from their website. And then there's other organizations that are out there, you can go to safetydifferently.com, not owned by me by the way, just want to make reference to that. And then Dr. Todd Conklin who I did reference a little bit earlier, he has some pretty interesting books out there, one's titled The Pre-Accident Investigation, and then there is another book called The Five Principles of Human Performance. They're interesting books. At least, you'll start getting and understanding the concepts of how this actually ties in. Thank you for that. Thank you for that. I'm sure our guests are going to be looking into those resources. But I have to give carte blanche on there because I know that I mentioned that Todd Conklin book, there is an audio format of it and I edited that book, or I produced it in the audio format. So if you hear my voice on there, that was not the reason I mentioned it. Understood. Dr. Conklin is well known in the safety arena. So, what happens with the career next and when does Safety FM enter into the mix? Well, the funny part was that I noticed that this worked inside of an organization and I said, this is something, I'm not going to say that we can repackage and sell but I knew that there's other organizations that need it. So I decided that I'm going to shift from being just at a location where I want to turn around and do just normal work every day. I want to go out and help different organizations because this organization that I'm working for, we'll say "the regional director" at the time or the, what are they titled, the Regional Director of safety, so I'm overseeing multiple states, there's so many other people that might be interested in this. So I started becoming a safety consultant and decided that, these are the concepts that I can go out there and use. And then I noticed that the fastest way to get to people, especially as of late is podcasting. It's podcasting and really being able to get information out there. And I was like, is there really a big market for people that want to listen to safety podcast? And I pulled up some and I was like, yeah, they're interesting. Then I looked at it and I went, but there's nothing that's being done in what I call "the radio fashion or the radio aspect" of doing safety. And I said, what if I went down that particular path and we started an internet radio station and we do the podcast just to see if we get people to respond? Well, I was surprised. I thought We were just going to get maybe a couple hundred people and I was way off my rocker. We got thousands of people to show up to listen to our podcast and to listen to our radio station. And it's just being amazing just in regards to the response, the people that are on there. And because we were able to develop it in a radio show format, we've had great people and great hosts, such as yourself, that have allowed us to take your podcast and reair them on Safety FM. And it's great because it's not just me talking because that can get kind of old relatively quick, but it gives you different concepts. So you'll listen to somebody maybe in the morning and they might be talking about VPP, and you might listen to somebody in the afternoon and they might be talking about behavior based safety. Because what I wanted to be is I wanted to be one stop shop in regards to you can listen to all things safety. But it doesn't have to only be the version of safety that I believe in. I wanted to be different points of views of safety in different arenas. Because it doesn't make sense if I just sit around and talk to you about transportation safety all day, where if somebody talks to you about mechanical failures and mechanical safety. I just wanted to be so different and I wanted people from different walks of lives besides being the host with the guests that are on the episodes. Yeah. Jay, and why do you think, I mean, I have my own theory on this, but why do you think it became so successful that safety people flock to information? Well, I think that what happens is people want to go and get some information and being able to jump out and not have to sit through some long courses. And now that's my opinion. And then you have to also notice that our little safety industry, the demographic is changing. I'm not going to sit here and say, old people need to leave because it needs to be done and it's all about the millennials, because sometimes when I start talking people think that that's what I'm saying. But we have a lot of people that are retiring out of this and we have a lot of new people that are coming in. And you have to actually source the information to the way that they receive it currently. I'm going to tell you, I'm not the best podcaster, I'm not the best radio host. But I'm able to get information to people in the format that they want it. And I try to bring in recognition for some of the people that are on, for people to go, okay, well, today we had somebody on and this person was from Tesla. Well, I know Tesla, I like the Tesla car, battery system, well, boom, let's hear what Tesla does. And that's an example. And it's just been able to get in get out, and I think that that's what's caused some people to be interested in it. And it's just weird because there's so many people wanting information, and I'm sure you go through the same thing. The amount of people that I interact with on a weekly basis, just contact me and saying, hey, I heard this on your podcast, could you give me more information or more direction in regards of where can I obtain more information? I think it's great because I don't want to just be a place but I also want to be a reference on where you can come and go. I might not have the answer because there's no way I can answer everything about safety. But I can give you general guidance or direction on where you can go to obtain the information. What's your thought process on it? Yeah. So, when you use the term little safety industry, I think that's really where it's at. We do have a pretty small profession all things considered. I mean, it'd be interesting. Wouldn't it be great to know like how many safety professionals are there in North America? I think that would be interesting. But we're a tight knit group. And so many of us solo operators need people to share information with us and we're always looking for something. And I think you absolutely hit on the next iteration of safety professionals. And you're right, people are retiring out of the industry. There's a bit of a shortage by way of safety professionals. And we have this new demographic that's joining us and they happen to be very technology savvy, which I think is why these podcasts are landing with them. And they also happen to be really business savvy as well. And I'm not sure why that's the case but it seems to be maybe a shift in safety professionals as it is and just a want to be connected. 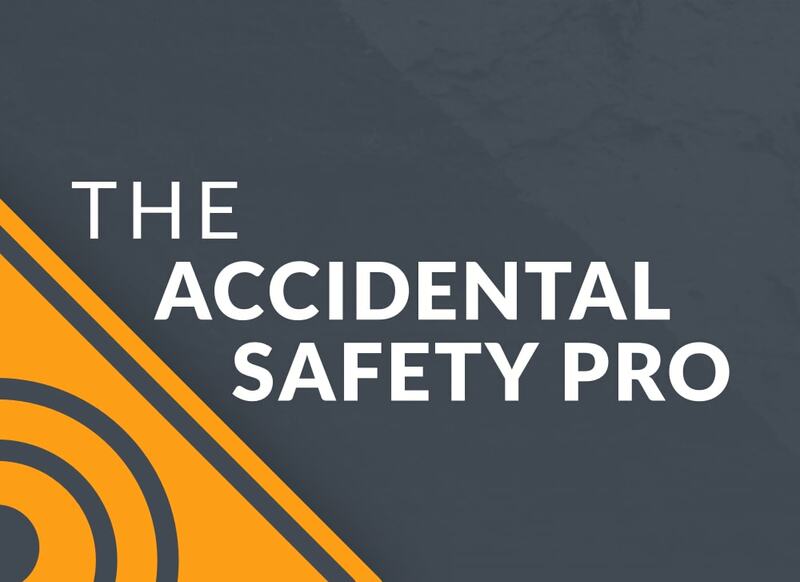 When we came up with this podcast, the Accidental Safety Pro, it came as a result of a request by our focus group. We have a focus group with Vivid Learning Systems and we're talking about, what do safety professionals need, how can we support them right now. And the resounding request was we just need to be connected to one another because we're sort of islands often. And we go to the conferences, some people get to go to conferences, and when you do, you're kind of mired in the business of the conference and learning what you can learn but you don't get to connect with other safety practitioners to find out how do they actually do this work. And others just don't have the ability to go to conferences because of cost or it's becoming possibly outmoded in some industries. And so, the request was, let's start a podcast so that we can share information with one another and dip into it, like you say, on your own time, in your own way, and meet you where you are on topics that interest you in your work. And so, that's my take on it. Sounds like it's similar to yours. Well, I think it's funny that you mentioned it that way because I also remember one of your first episodes when you were talking about the focus group, and you turned around and you said that you decided to do a podcast and you had to tell people inside of your group what is a podcast. Well, actually, they had to tell me. They had to tell me, the focus group said podcast and I'm like, what is that. I know what a webcast is but I don't know what a podcast is. My marketing department was very instructive, Jill, this is what a podcast is, why aren't you listening to them? And so, I'm like giant podcast fan now. I love podcasts. I probably, I know that I listen to some every day. It's just part of my normal routine of educating myself. Not all safety podcasts but other ones as well. I know, right? So Jay, the burning question then is, do you listen to other podcasts that aren't safety related? Male soap operas, version of what we call wrestling. Those things I find so intriguing, especially if I can find something that's talking about an older wrestling scenario where all these back stories and I don't know why I find it interesting. There's also one that's called The Minimalist, and that one just really talks about minimalizing everything inside of your life. There's some that I listen to that are very popular but they're not "kid friendly." But I do like those too. I have to ask you a strange question, I'm going to kind of go back on the subjects a little bit. When you decided to or when they brought to you better saying the whole scenario of doing the podcast, why did you agree to do the podcast if you weren't, number one, familiar with it? And how did you feel about doing a podcast starting off? Because if you're not familiar with it and all of a sudden, now you're going to be the face or the voice better saying in this case? Yeah, easy answer. And you just turned back into the interviewer, Jay? No, that's fine. This is excellent. Well, it's because I love to collect stories. I love to collect stories, I love to tell stories. When we were talking about how could we make this happen, my marketing director said, Jill, what are you going to make the focus of this podcast? Like you have to have kind of like a theme around it. And I said, well, I guess it's what the leading question when I meet a safety professional, fellow safety professionals, the first question I always ask them is, how did you get into it? Because I'm genuinely interested in the story in the path that led to the career. It's always a winding road as we've established, nope, two people have the same sort of trajectory to get into it. And it often has something to do with something that happened and stirred something deep within them at a heart level that is also the reason why they stay at it. Just like you've told today, you know, you had this event happen that you became part of with this motor vehicle accident. And it really stirred something in you that kind of changed the way you operate. And I bet you still think about that and kind of lean into that. And it's maybe still what drives you to do what you do. I would definitely say sure, I do because it's that story. And, of course, as you know, the more you're involved with this, the worse things you see, is really how it works out. And it becomes interesting because it becomes part of your presentation on what you give to people. And it's not trying to cause an emotional event or to stir the audience, but it's more along the lines of understand, if you possibly put some things in place, you can avoid this scenario. It happened to me, and I don't want to see it happen to you. Right, right. Absolutely. Yeah. Same for me. Love it. Yeah, so my podcasts that I listened to that are not safety related. I listen to one called The Beautiful Writers. It's all about people who are professional writers, very famous writers, and they talk about their writing discipline and how they kind of work their craft, and when they write and how they write and what resources do they use to write upon, and do they type, do they use a pencil, do they use programs? what time of day do they write? How do they get creative? Where do they come up with their stories? Beautiful Writers, I follow that one. And a really intriguing one lately I've been listening to this one called Family Secrets. It's all about stories as well. And another one called Masterclass. People telling their stories. Again, this is the theme, I love listening to stories, I love telling stories. So it's all about people telling their stories. And those are some of my favorites. That sounds very interesting, especially the one about the writers, something I probably need to look into, especially down the arena that I've been going through as of late. I want to reference this to you, somebody told me this recently and this is might be a little bit off subject so I apologize. But that term masterclass, I was interacting with a very close friend of mine and he was offered to go to a training session or training seminar, and they were calling it masterclass. And he refused to go because of the titling. Do you find the titling offensive? I do not maybe because of the way like this particular one is framed. I get where that person is coming from because there's an assumption with a title if you look at it just from that perspective that there's a linear path, and follow this path, you will become a master. And I guess if maybe, if you've lived a little bit of life, we all know that you can be masterful at something and find your own way to become that. And in fact, becoming masterful or being a master of something means that you've really developed it on your own and it's what's inside of you and it's not something that you've taken from someone else. Does that make sense? I don't find it offensive but the way that the person reacted, I was like, hmm, you mentioned the title, I said. Yeah. I mean, Jay, look at your own career, right? I mean, are you a master at what you're doing? Yes, I would say that you are. And the method that you use to get there, you know, if I were to draw your path right now, it would be sort of this maybe up and down sort of bouncy line, where you were, you started in one place, you used all of your resources that you had, whether it was using your education and developing things like the theater of the mind and you found a mentor. And then you're like, okay, and I'm going to be a consultant, but then I'm going to dip back into industry and I'm going to practice all these things that I learned and then I'm going to go back to school and I'm going to gather a bunch more information and I'm going to get back into industry, I'm going to be a consultant. It's just like, you kept testing and educating yourself along this path. It's really fun to listen to this story of kind of how you did that, entrepreneurially for yourself and your career. I think it's pretty remarkable. I appreciate you saying that. But I'll tell you, I look at it and I go, I don't feel myself like a master of anything. I still feel that I want to learn as much as possible, I try to get as much information as I can, day in and day out and I'm always doing some kind of research or studying on maybe a subject that I don't understand or something new that I can use for the consulting services side of the business. Right. Same. Absolutely. I think my partner in life has hung this sign in my house one day. And he said, my name is, is for me, he wrote it for me. He's like, I'm Jill James, and he wrote in my age at the time, and it says, "I'm just getting started." And that's really true. So I look at that often and I'm like, yeah, I'm just getting started. I'm continuing on my path as are you. So how many years have you had the sign up? You didn't give the age, I'm just asking a question. No, I'm trying to think because I've scratched out the age and I keep rewriting it. And I think four times I've rewritten my age on that. So that happened a couple of years ago. So Jay, speaking of what's next, what iteration of life are you on now? What's next for you?